At first I thought this would be my final project of 2012, but I enjoyed New Year's Eve with my family and finished this off today. I made this bag for my daughter as a new overnight bag. She's been using a backpack that's just way too small, and not nearly stylish enough. 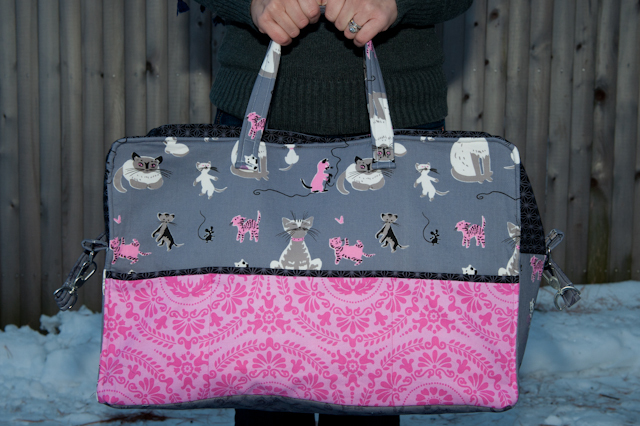 This is the Holiday in London Duffle Bag pattern by my dear friend Bari J. As with all of her other patterns, this was well written, with helpful pictures, and a really good amount of explanatory detail. 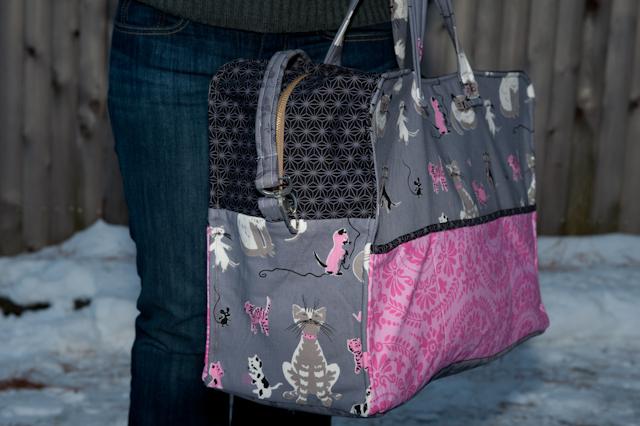 I used some Tammis Keefe cat print that I had been saving for just the right project, and I think it's great for a girl's bag, that not to childish looking. I think she'll be able to use this for a long time. A few things I learned while making this pattern. First, the type and quality of fusible fleece that you buy is SERIOUSLY important. I made the long strap with a thicker version of fleece and it made it nearly impossible to turn the sides in 1/4" to press them before folding the strap in half. The result was a too-thin strap. I will be re-making that for sure. Another learning with this bag is just how important it is to trim. With so many layers, I had to pin like crazy and still some of the seams were not as straight as I'd like. Finally, there were so many layers in some spots that I literally had to turn my wheel by hand to get the needle through the fabric. (This was a great tip I learned from another of Bari's patterns). If I let the machine try to stitch through all those layers, the needle just jammed. By hand turning, I could get through the 4-5 stitches that were just too thick for the machine. I am very happy with the way the bag came out overall. I didn't realize that I had bought a goldtone zipper and silver hardware. This is my biggest beef with how the bag came out overall. On the plus side, the zipper opens nice and wide because of how long it is, so you can easily fill the bag, and see the inside (which ALSO has pockets!). Things I didn't take pictures of, but are important to note...the whole bag is lined. I used a pink and white houndstooth vintage sheet that I bought from an Etsy seller that was PERFECT. I think using a light color inside will make it easier to find things. 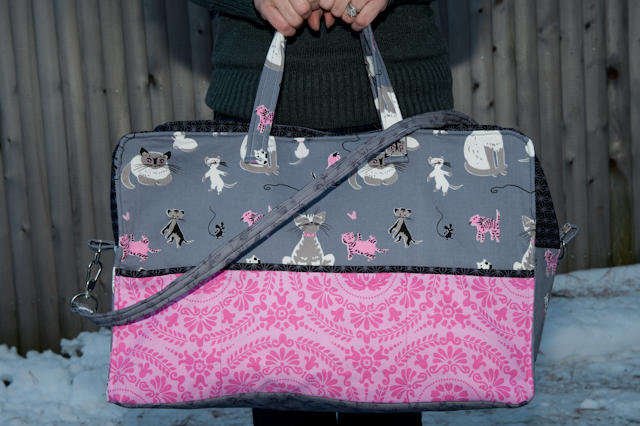 It also has a hard bottom insert to keep the bag looking firm and sturdy. Overall, this pattern gets an A+. I will be making more for the other kids to be sure. Oh this is too cute! I love it!